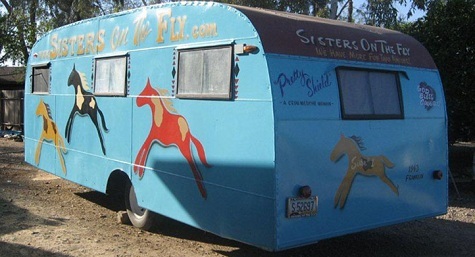 Traveling with the group known as Sisters on the Fly is definitely on my retirement Wish List. These female road warriors, ages 20-something to 80-something, travel all over the U.S. by truck, travel trailer and camper caravan. They fly fish (hence the name), they ride horseback, they take part in cattle drives. They even attend Cowgirl College. Every once in awhile they let the menfolk join them, but not often. Most of the travels are in the Western U.S. If you don’t mind roughing it, and you love the open road, this group just might be for you. Of course, you’ll need either a camper or a truck and travel trailer. Check out their site – there’s often one or two gently-used and well-decorated trailers for sale. Besides enjoying the great outdoors, you could make some lifelong friends. And, there’s safety in numbers. How many of us don’t venture to places we’re dying to see because we can’t find anyone to go with us, and we’re nervous for our own safety? By the way, Sisters On the Fly was actually started by two sisters – Becky and Maurrie, from Montana. All you wanderlust-filled women out there, do check out this great group!